If you love clothing and textiles, you have probably wondered how to find the best degree to become a fashion designer. Naturally, you should study fashion design. Although some big designers have managed to attain success without a college degree. A degree from an accredited design school will help you to gain credibility in this fast-paced, highly competitive career field. Aspiring fashion designers can choose from associate’s and bachelor’s degree programs, according to the Bureau of Labor Statistics. 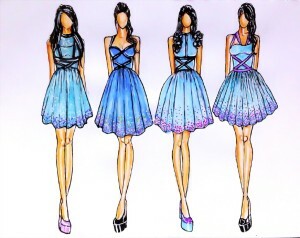 Any program you choose should include basic coursework in color, textiles, sewing and fashion history as well as in computer-added design (CAD). You will likely find classes in math and human anatomy valuable to your work as a designer as well. Since the design world is inextricably linked to the advertising and business world, classes in business and marketing will be valuable tools for you as well. Internships are non-negotiable for the aspiring fashion designer. You simply must have one in order to break into the design business. When choosing a degree program, try to find one that includes internship placement or similar assistance. In addition to an internship with a design company or manufacturing firm, work in a retail clothing store can also be helpful to aspiring fashion designers. This type of work will help you understand fit and form as you work to help customers locate styles that look the best on them. While participating in a design program at your chosen institution of higher learning, you need to be building our portfolio. A great portfolio will showcase your eye for color, fashion, style and design. It should be your personal advertisement and should clearly communicate your unique style and focus. Each element in your portfolio should be of the highest quality, and the portfolio should include sketches, pattern and photos of completed projects. In addition to showcasing your work, the portfolio should also present your ability to collaborate with others on design concepts. Don’t expect to enter the fashion industry easily. This competitive field only has room for the most tenacious individuals, and you will have to work hard at all hours of the day, every day of the week to achieve your dream of becoming a fashion designer. Prepare to begin your journey with an entry-level position, even after you have completed your degree and an internship. Over time, your tenacity will begin to pay off. As you continue to work hard and create unique, eye-catching designs, you will begin to climb that corporate ladder and increase your influence in the area of design. Like any fulfilling career, becoming a fashion designer is hard work. However, with the right education and the right attitude, you can succeed. You might even become the next Jason Wu or Lady Gaga. Talent goes a long way, but before you achieve fame and fortune, you need to take the time to learn how to choose the best degree to become a fashion designer.